This entry was posted on June 23, 2010 at 8:58 am and is filed under Afghanistan, Barack Obama, Conservative Issues, Economy, George Bush, military, Politics, War. You can follow any responses to this entry through the RSS 2.0 feed. You can skip to the end and leave a response. Pinging is currently not allowed. Well, Mr. genius, all I can say in response is that if you’re going to call me an idiot, you probably shouldn’t use a possessive pronoun in place of the contraction you were clearly striving for but just not quite smart enough to pull off. The bottom line is that you really look like an idiot calling me an idiot. Bush took office at a time when the federal government was running a surplus and had an accumulated national deficit of roughly $5 trillion dollars. In his eight years he doubled the deficit, adding $5 trillion by launching two unpaid-for wars, one unpaid-for $1.7 trillion gift to the pharmaceutical industry (Medicare Part D) and two tax cuts designed to spur the economy. How did that work out? I’m going to respond to your post, Michael, and then I’m going to block you. People who begin their posting to me using personal attacks are not worth having a sustained dialogue with. If I ever go to your blog and start out by personally insulting you, please feel free to block me, too. It’s rather funny that you would call me a “clown” and then use as clownish an argument as one can find. Essentially, you’re argument is that Obama’s unprecedented massive spending is fine, because Bush (whom you condemn) spent a lot of money too. So you demonize Bush for spending, but refuse to criticize Obama even though Obama is spending three times more than Bush. Bush did some really bad things. When he said he was abandoning the free market system in order to save it, that was bad. When he passed that prescription drug act that you mention, that was bad. Nowhere near as bad as ObamaCare – which is the prescription drug program on mega-steroids – but it was bad. So I’ll tell you what: I’ll demand that Bush leave in disgrace if you demand Obama leave in disgrace. You go on to cite an op-ed by some guy writing in some pissant journal as though it’s somehow supposed to be accepted as some universal standard of measuring presidential worthiness? Really? And in particular, one that presents JIMMY CARTER as worthy of being the fifth face on Mt. Rushmore? Really? Bush created 52 consecutive months of job growth. That’s pretty darn good. It was either the longest or second longest streak for job growth ever recorded. Jimmy Carter could only dreamed he could have had that kind of record. And Bush’s average unemployment rate throughout his presidency was 5.2%. Same as Clinton. Let’s just take some numbers you present and go from there. Okay. Bush increased the national debt by five trillion, leaving us with a $10 trillion national debt. That’s really bad. Again, Bush should leave office in disgrace for that kind of spending. But the national debt is now over $13 trillion under Obama. Obama added three trillion to the debt in only 18 months. By the same measure you use to damn Bush, Obama should be triple damned. Obama should be impeached, don’t you agree, Mr. Damn-Bush-for-Spending? So let’s do the math. On the same eight year average in which Bush added $5 trillion, Obama will have added $16 trillion. Obama is spending at a rate more than three times Bush. And it is your contention that Bush was a failure for less than 1/3rd the spending that Obama is responsible for. Does that actually seem fair to you to attack Bush when Obama’s spending is that much worse? Are you that much of an ideologue? Do you understand why people like me just mock people like you? Bush deficits were 2-3% of the GDP. Obama’s deficit is 12.8% of GDP – which is five to six times higher than anything Bush gave us. Because not only did Bush have far lower deficits than Obama, but his economy was far stronger and produced far more. And that leaves us in a far more vulnerable position. Obama’s spending is completely out-of-control and we are now so far overextended it is beyond unreal. Obama expanded the government budget by nearly a third larger than when Bush left it just his first year. Bush never expanded government by more than 6% in any year. Now, having said that, I have to correct you and correct the record: it wasn’t CLINTON who gave us a deficit surplus. It was a Republican Congress that gave us a deficit surplus in fulfillment of their central plank of the Contract with America. The fact of the matter is that Bush wasn’t anywhere near as bad as demagogues such as you make him out to be. Whereas Barack Obama even worse than you accused Bush of being. Thank you for your gracious words, Ivelisse. You got one of my reasons for blogging: educating people about the truth. For the record, the other is leaving behind a record of what this terrible president did to destroy America at a time when great leadership was needed most. I hope you don’t mind if i write down what you wrote to share with my very democratic sister’s. Your perceptions are great! Mind? My purpose for blogging was 1) to get the word out, and help conservatives present a conservative case, and 2) to preserve a record of this incredibly failed presidency and Democrat Congress. I am delighted you are trying to reach out to your sister, just as I am delighted you find my work helpful. I’m saying a prayer for you and your sister and your outreach to her as I type! You’re (you are) right on. Obama’s politics make me sick. He is ruining our country and is backwards in his economic understandings. He surrounds himself with so many liberals who have no clue how to create jobs. They care more about an endangered fish than people being able to feed their families. So many people who voted for him, did not listen but are now finding out who he really is. I can not wait for the American people to have their voices HEARD in the upcoming elections. The presidential elections will not be here soon enough. His kind is a cancer that the American people will have to cut out of our government. Well, let’s be fair. Liberals don’t just put “fish” over people; they put “Delta Smelt fish” over people. What, are you an arrogant specist who thinks your child is more important than a Delta Smelt? Particularly in a state where the Democrat vote has long-since been bought and paid for, such that the people who are literally left to die so the Delta Smelt can live don’t matter whatsoever? I’m joking, of course. Great comment. Agree with every word. Obama has fewer cabinet officials who have any business experience at all than any president in the 20th century. I must agree with Kleinfeld, Europe is the ideal to emulate. Let’s generate 80% (or more) of our electricity with nuclear power like France, and require people to keep automatic weapons in their homes like the Swiss. You’ve got me there, alanstorm. Emulating Europe in the sense of having abundant nuclear energy and having an automatic weapon in every home sounds pretty good. I guess Europe is the same way. Bush was blaming Clinton for the economy in the 2004 election. 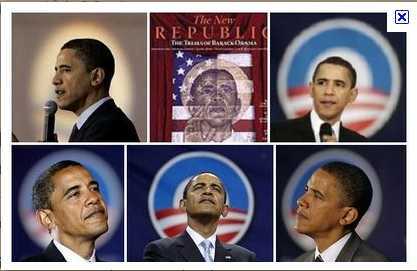 So by the 2004 Republican standards, Obama is doing fine & should get a pass on the economy for 4 to 8 more years. Applying the standards of the political parties from 4 years ago shows the hypocrisy of both sides. In actuality, it is ridiculous to blame Obama for the economy when he’s had less than 2 years to fix the biggest meltdown since Great Depression. They really do think that we’re idiots. So, that 3.2 percent number comes from here (pdf). Where’s the bamboozle? Let me count the ways. 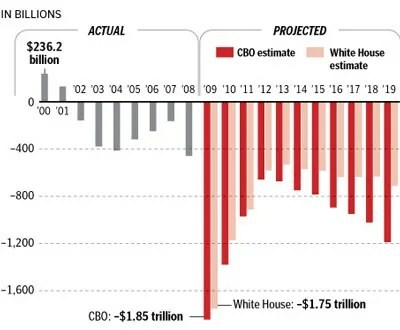 What this chart really tells us is what you should have known already: the deficit is overwhelmingly the result of the economic slump, not Obama policies. But the usual suspects want to fool you. I’d like to think that the raw dishonesty of this latest Bush defense would be obvious to everyone. But after the past decade, I’ve stopped believing such things. They think we’re idiots — and they may be right. One of the very interesting things I noticed from your CBO chart was that revenues from Bush dwarfed Clintons. I totalled them up. In his eight years, Clinton created $13,507.6 trillion in revenue. Versus Bush, who created $17,159.1 trillion in his eight years. That in spite of a major market crash created by Clinton, a massive attack and two wars. Not bad for the guy you say was the worst president ever. And the numbers really took off for Bush following the enactment of his tax cuts. Which INCREASED REVENUE. Because lower tax rates ALWAYS increase revenues. You want to consider debt from 2009? First of all, you need to realize that Bush only used HALF of the $700 billion in TARP money. He left the rest for Obama to use. That $350 billion would be on Obama’s tab in a fair world (alas, it’s not one). Second, according the CBO, the actual cost of Obamas’s terribly-named “stimulus” was $3.27 TRILLION. Tell me if this doesnt ring true. During the Clinton administration americans were attacked on foreign soil and domestically several times with little to no response from us, this led up to a boldness on the terrorists part that brought us to 9/11. During the Bush administration after 9/11 I can recall no attacks on our soil or soveriegn soil. During Obama’s 3 years we have had several more “little attacks” fort hood etc, that have gone with NO response from the white house, often not even called acts of terror and we are advised not to prejudge even after the connection has been found. He is setting us up with all this political correctness and dont judge terrorists, or better yet call them something else like undocumented soldiers of another religion we should try to understand!!! Hate to say it but without someone strong in the WH we are doomed to repeat 9/11 on an even more catastrophic scale. It rings pretty true. Even though it sounds awfully terrible. Bill Clinton couldn’t have been MORE responsible for 9/11. First of all, Bill Clinton is the president who took advantage of the so-called “peace dividend” that Ronald Reagan and George H.W. Bush won before Clinton took office to gut both the U.S. military and the U.S. intelligence community. Thanks to Bill Clinton, George W. Bush took office presiding over an America that was both far weaker and far more blind than it had been when Bill Clinton took office. Secondly, Bill Clinton massively expanded the humanitarian operation in Somalia that Bush I began. Clinton decided to get the warlord Mohamed Farrah Aidi. That would have been fine if Clinton had done it right; but Clinton DIDN’T do it right. He didn’t want to create any bad PR by building up the military presence, but he expanded their military mission in a way that DEMANDED a massive buildup. We needed tanks and we needed heavy armor to go into Mogadishu in force. All it took was for one Blackhawk helipopter to get shot down and the entire mission turned into a total disaster. And the U.S. force was powerless to get in and get their people without sustaining huge losses. It ultimately took us literally begging a very pissed-off armored multinational force that was beyond angry for not having even been notified of the botched operation to get what was left of our shot-to-hell rescue force. It was BECAUSE of that failure, BECAUSE of those pictures of the naked U.S. personnel being dragged in humilitation down the streets and BECAUSE of the way we cut and ran with our tails between our legs that a man named Osama bin Laden concluded that America was “a paper tiger” and that we would flee if we suffered any casualities. As a result of Osama bin Laden being emboldened, ALL of the 9/11 terrorists were in the United States with the operation having already been planned and put into motion during Bill Clinton’s watch. Then there comes the fact that 9/11 mastermind Khalid Shaikh Mohammed – maybe after having been waterboarded until he grew gills – said that the American response under Bush was so massive and so terrifying that he doubted that al Qaeda would ever dare to directly strike the United States again. Saddam Hussein – the strongest strongman in the Middle East – was humilitated and executed. Muammar Gadhafi – the craziest nut in the Middle East – abandoned his WMD programs. Then a pathetic weakling became president. As long as the pathetic appeaser Neville Chamberlain was prime minister, England was a weak nation desperately hoping that Adolf Hitler wouldn’t hurt them; when Winston Churchill took over (after Leo Amery’s famous denunciation to Neville Chamberlain: “Depart, I say, and let us have done with you. In the name of God, go!”), England became strong. Just as England went from weak to strong under Churchill, America went from strong to weak under Obama. One of the areas where the weakness of Obama was MOST readily apparent was Iran. George Bush was determined to confront Iran over its nuke programs, rightly understanding that this religiously insane nation would use them. The only thing that stopped him was the pathetic treasonous weakness of Democrats. And then the most pathetic and treasonous weakling of all the Democrats became their king. And now it’s full speed ahead as Iran works non-stop toward Armageddon. You call me a “fascist moron” for printing THE FACTS without bothering to even try to in any way, shape or form show how those facts aren’t facts? That’s a very fascist moron thing of you to do, Allen.